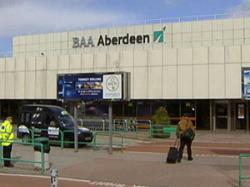 Aberdeen Airport is located in Dyce which is just seven miles North West of Aberdeen, flying to 30 destinations. This is Scotland’s third busiest airport which originally opened in 1934, since then the passenger numbers have escalated and in 2007 saw 3.4 million passengers visiting the Airport, which has just obtained a prestigious global award for Best Improvement To Service Quality. There is a choice of ways to arrive to the airport with good bus and coach links, and by train direct into Dyce station which is just a short taxi ride away. For those wishing to drive the Airport is on the main A96 Aberdeen to Inverness road and has a choice of a 1000 short stay and 900 long stay car parking spaces, or there is always valet parking. Aberdeen Airport is also Europe’s largest commercial Heliport servicing the UK’s Off Shore Oil Industry and saw 4684 helicopter passengers in 2007. There is an Information Desk on the main concourse in the Check In Area which has 20 Desks, Cash Dispensers, and Luggage Trolleys are throughout the building, together with a varied choice of restaurants, bars and cafes most of which provide high chairs and Menus for children. Of course there is Duty and Tax Free shopping, Baby Changing facilities and a Play Area on offer. Or if comfort is required then perhaps the Executive Lounge will tick the box with complimentary hot and cold drinks, and snacks all served within pleasing surroundings. Special Needs passengers are also well catered for with Induction Loops for the hard of hearing together with a Reserved Seating Area which are available within the Terminal Building, and Help Points which show the location on a map and a choice of two telephones, one to call a Porter, and one to request assistance.